Safety Surfaces' synthetic grass systems are manufactured right here in Australia by the leader in the field for over 30 years; Grassman. Grassman have the capability, knowledge and experience to manufacture the latest generation in football and soccer fields. They have access to the worlds most technologically advanced yarns and materials and manufacture the highest quality products from 40mm to 100mm pile heights that have been installed worldwide. The biggest challenges in creating a synthetic turf system are safety and performance issues. Everyone wants a surface that will greatly reduce the injuries, perform like natural turf in perfect condition, and be durable enough to use 365 days a year. Safety Surfaces supplies and installs products that are tested using a computerized G-Max testing machine in accordance with ASTM F-355 procedures. All of the field products supplied by Safety Surfaces surpass the ASTM requirements. grass and therefore, from a perspective of injuries, is a good alternative to natural grass”. The biggest benefit of a synthetic field is increased play hours available as synthetic fields can be open for play year round. Play can be held during and immediately after rainy weather. Maintenance costs are lower as synthetic turf requires no mowing, watering, fertilizing, or re-seeding. Instead, the maintenance of a synthetic field simply involves raking or redistributing the rubber granules periodically and blowing off debris. 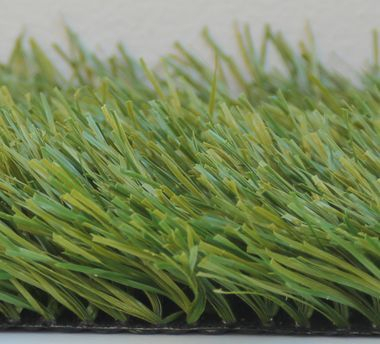 The infill provides players with comfort and safety compared to hard natural surfaces. The environmental benefit is considerable with huge water savings amounting to many thousands of litres per annum for each installation. The removal of pesticides and fertilisers means less chance of contaminating ground water and safer field conditions for children, players and wildlife. Safety Surfaces can supply and install from a range of products to suit your requirements and budget.